Anita Osterhaug’s Mountains of Iceland scarf. 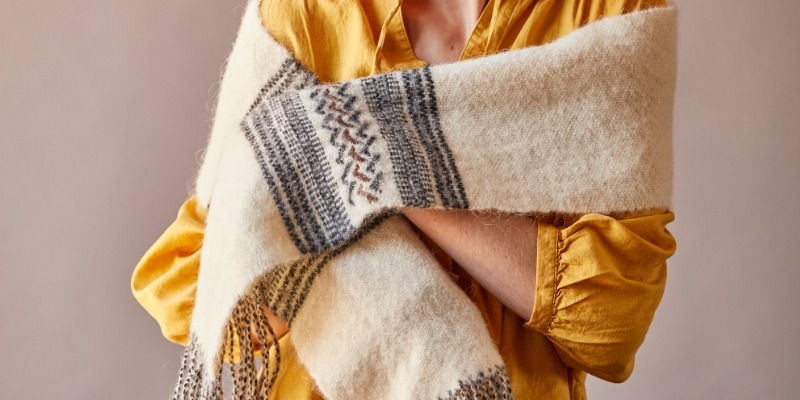 These day, most of us know Icelandic yarn through beautiful Icelandic sweaters we may have purchased or knitted ourselves, but Icelanders have woven blankets with their wool for ages. I love the natural colors of Léttlopi, or as it’s more commonly known, lopi yarn, especially the bright white, pure as Icelandic snow. For this scarf, I did some patterning with simple pick and pick (using different colors on alternate plain-weave sheds), and I designed a pick-up inlay pattern based on a common pattern from Icelandic sweaters. The scarf reminds me of the mountains of Iceland on a background of snow. I used a spinner’s trick to make a fun fringe: three-strand crêpe yarn. Lopi is a loosely spun yarn, and it needs to be handled gently. (It looks like a singles yarn, but Linda Ligon pointed out to me that it is not. Try pulling apart a scrap—you’ll be surprised!) Please read the weaving notes carefully before beginning the project. In particular, note that you will use the rigid heddle to make a shed but not to push the weft into place; instead, use a smooth wooden pick-up stick or weaving sword. If you don’t have one, this is a great excuse to buy a lovely weaving tool or talk a woodworker friend into making one for you. STRUCTURE: Plain weave with inlay. EQUIPMENT: Rigid-heddle loom, 10″ weaving width; 8-dent heddle; 4 stick shuttles; 1 smooth pick-up stick, about 15″ long. YARNS: Léttlopi yarn (100% Icelandic wool; Halcyon). OTHER SUPPLIES: Liquid seam sealant such as Fray Check. 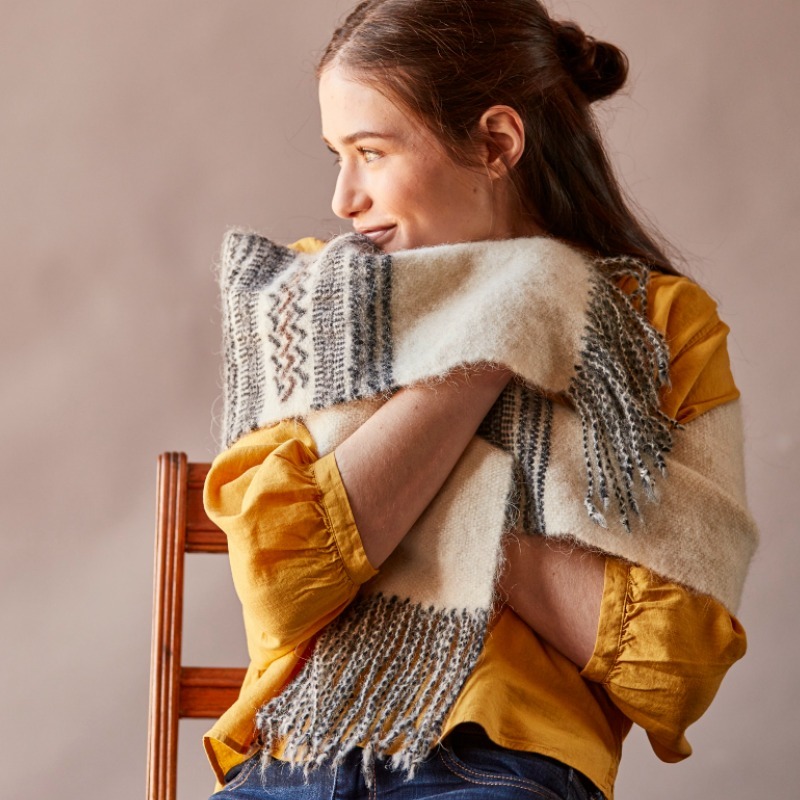 Featured Image: Anita Osterhaug was inspired by traditional Icelandic designs and used pick-up on the rigid-heddle loom to weave her own version. 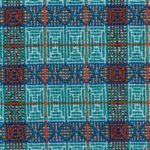 Discover something new in every issue of Handwoven!